Providence Academy Word | What Was the National School Walkout? Great Pacific Garbage Island What Do You Meme? Three months ago, Nikolas Cruz opened fire on the Marjory Stoneman High School in Parkland, Florida. In all, he killed 17 and wounded another 17. 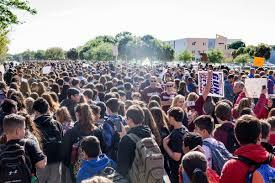 Motivated by this, students around the nation have staged massive walkouts to ensure no student has to run from a gunman again. Throughout the country, on March 14th, a month after one of the deadliest school shootings in America, students and faculty walked out. With numbers ranging from the hundreds to the thousands, they were dead set on changing America’s gun law system, a system many are calling ineffective and broken. Along with the hope of change, they walked to honor the students and faculty of Marjory Stoneman and keep them from becoming just another statistic. This walkout was not without controversy. Many schools, including PA, promised penalties for any student who walked out. In spite of this, many students at other schools were willing to face the consequences to honor their fallen peers. Dr. Flanders, PA headmaster, described his policy in a recent interview. He said, “As a private institution, we reject outside intrusion”. This was a very real problem many private schools had with the walkouts. He highlighted his concerns about the lack of willingness to engage in civil discussion that has become commonplace in American society. Providence’s policy of “talk don’t walk” was the best way to address such a pressing and divisive issue. PA held a symposium on gun violence, featuring two articles. One from a pro-gun high school freshman, and the other, a more anti-gun article from the Washington Post Editorial Board. The goal of this symposium was to offer students, Juniors and Seniors, a place to voice their concerns and discuss one of the most hot-button issues of our day. Many other schools felt that the walkouts, organized by both Parkland students and EMPOWER, the youth wing of the Women’s March, were not designed to respect the fallen but rather to advance an agenda. Along with controversy from school administrations, many students around the country participated in counter protests where tensions often boiled over. Minnesota wasn’t free from altercations either, a student at Southwest High School in Minneapolis ran through the area where a moment of silence was being held for the Parkland victims waving a Trump flag and allegedly yelling racial epithets and other obscenities. The Trump flag toting student was assaulted in retaliation and had his flag taken away before the police were called. 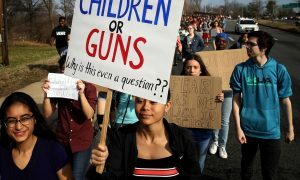 On March 14, 3,000 schools registered to walk out. The turnout was incredible, the mission of the walkouts had been to show how much gun control matters to the younger generation. Even without direct legislation as a result of these walkouts. many felt that they had accomplished what they set out to do, call attention to the problem of violence within our schools.